The M80 is the top-of-the-line Newton M Series bookshelf. Each beautiful real-wood enclosure contains an 8-inch woofer, a 3.5-inch midrange driver and a silk fabric tweeter. The three-way design ensures realistic and precise sound with wonderful stereo imaging, a trait often lacking from bookshelf speakers. All of the speakers in this line feature the finest drivers, precision internal crossover design and elegant enclosures. Great care has been taken in order to combine audiophile-level details and reasonable cost. 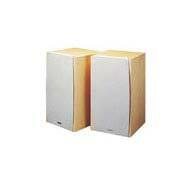 The speakers may be positioned vertically or horizontally on any flat, stable surface. Self-adhesive rubber feet are included to protect the finish of the speakers. The versatile M80's tweeter/mid-range mounting plate can be repositioned, in case you choose to place them horizontally. The M80's can also be bi-wired. Bi-wiring uses one length of speaker wire to drive the tweeter/mid-range section of the speaker and a separate length of speaker wire to drive the woofer. Both lengths of wire are connected to the same full-range amplifier speaker outputs. Available with knit grilles and in the same blonde maple and mahogany real-wood finishes as the Newton Series towers. Also available in slate. For the money, not bad. I have had these since they were new, some time in the 90’s. They have been matched with 3 different system, a Sony seperates, an Onkyo receiver for the 90’s, and current running bi-wired from a Rotel RA-1060 integrated. These speakers seem to accurately reflect the characteristics of each of these systems. The highs are clear and fairly well detailed, rarely harsh, except with bad recordings. The mids are present, but to my ears could be a touch sweeter. Not a complaint- more a preference. The bass is solid, not overblown. I have them about 10” from the back wall in a 24’x20’ room in a 2.0 setup. Plenty of volume. Fans of bombastic bass will add a sub anyway. These get very loud, but sound a little congested when pushed. I mostly listen at mhoderate levels to classical, jazz, rock, and drone ambient. Imaging is fairly good for these styles. They are large and quite heavy. If you can find a pair in decent shape for a good price, consider them. Just feed them with quality watts and I think you will enjoy them. I believe the year is correct. They were OK overall. The bass is muddy at higher volumes with music and movies. The bass is almost punchy and overpowering yet without the definition I'd like. I can fix it by adding the Cambridge Soundworks P1000 but generally I'd rather run the speakers without a subwoofer. The real problem is that in my system, which has a Yamaha RX V990 watt receiver, I believe 4 times now I start hearing a tinny sound, soon realizing the midrange tweeter assembly has again failed. These are correctly bi-wired which helped the sound quality immensely to my ears. Since in my years since the cheap Pioneer speakers I blew at College 30+ years ago, I've not had the problem with any other speakers. I also have an old pair of Paradigm Eclipse that to this day I haven't heard better. They were purchased back in 93 and I'll take these with me for the rest of my life. Not so much on the M80s. I need to get another midrange/tweeter unit and sell these puppies once and for all. I just bought a pair of m80s on eBay for around $100 shipped. I bi wired them and am driving them with my vintage Marantz 2238b. All I can say is wow... these speakers sound INCREDIBLE! I have owned ads l1290, Pioneer hpm100, jbl l100 t3, and other audiophile speakers. These keep up with the best of them. By far best bookshelf speakers I've owned. The sound is big, fairly detailed, crisp, without being harsh. Some have said they sound muddy... nope. Anything but. Very clear, great midrange, and solid, accurate bass. I won't be parting with these bad boys. These speakers are cosmetically excellent, built tough, sound pretty good. Want a great tip? The M60's sound better! I have both sets and the bass is actually better on the 6" driver M60's. I run very very powerful carver amps and run the m80's bi'd with a second set of CSW t500's which rock. 1) These speakers are meant to be bi-wired. This is a feature found on high-end speakers and should be taken advantage of. It will clear up any 'muddy' bass issues. 2) The amp you use is very important, for any speakers, and will color the sound of music almost as much as the speakers will! These speakers do best with clean power, I'd say at least 50 honest watts. 3) Any new speaker will need to be broken in before it sounds its best; times will vary but I'd guestimate about 20 hrs. of listening for the M80s. 4) Pick the speaker up, or try to. Feel the finish. Look at the binding posts on the rear. These are extremely well-made pieces with sufficient rigidity for chest-thumping bass. I don't care where they were made, and I can tell you this: if they were assembled in America they would sell for $1200 a pair, maybe more. 5) How good is your source? If you're listening to FM it's not a fair test. FM can sound great, but usually it's not a reliable source for judging speaker sound. How well-engineered was the album/recording? A poor home-made tape will sound equally poor on even the best stereo system. Ok, that said, I ran a plain-Jane Alesis RA-100 studio amp with these. 75 clean watts, paid $100 for it at Daddy's Junky Music. I played CDs off my laptop and from a Salvation Army Sony CD player ($10). The M80s delivered tight, muscular bass, splendid mids and celestial highs. Did they go low enough to make all the dogs in the neighborhood howl? No. Did they go low enough to make me grin like a fool and shake my head? Yes! At times I would hear things on CDs that made me jump because I had never heard them on the passage before. These speakers are accurate enough to reveal deficiencies in the source material. Fast-forward to February 2009. I'm running 160 watts (160 TRUE, RMS watts with dynamic peaks of 400 watts) into them. Radio Shack wire. No speaker stands, no special placement of speakers. I'm playing a tape (that's right, a TAPE) of Bob Seger's "Nutbush City Limits" I made from his 'Live Bullet' album and so help me God, it feels like the drummer is in my living room. I can feel the drumbeats in my body, through my chair (and it's a big chair), and I know I've got that sheepish grin on my face again. The speakers never sound like they've reached their limits (although 160 watts IS pretty much the limit before going with giant DJ speakers). The icing on the cake is that these speakers stand head and shoulders above virtually all other speakers in their physical beauty and understated elegance. They look nice in any room. They don't take over the living space. And they perform the 'ten-clowns-in-a-car' trick of sounding much, much bigger than they really are. I will never sell them and feel that $500 for the pair was a bargain. I'm no audiophile but these really don't sound good to me. The bass is just not there and overall the sound is very washy. I was really hoping to like these but when I compared them directly to my Klipshe SB-2 speakers I was shocked by how much better the klipshe sounded. The mid range is very good on the CSW and thats were I see their strength. You have to crank these things to here the bass. Thank gawd there is a good return policy. Considering they only cost me $200.00 and I'm still bringing them back should tell you my opinion on them. These things look much better than they sound! I compared these to my Klipshe SB-2 bookshelf speakers. Nice treble response. Good bass. Great build quality. 10 year warranty. Could sound a bit warmer. They sound great in my living room with wall to wall carpeting. Tried them in place of my Mirage M-290's in the den, and they did not sound as "warm" as the M-290's. I was looking for a pair of larger bookshelf speakers to put in my living room. I listened to a bunch of different speakers. I decided to take a chance on the M80's. I'm happy with them. Classical & folk music sounds good through them. Can't really comment on how rock sounds, as I don't listen to it all that often. The speakers sound clean and have acceptable bass response. The build quality & cosmetics are excellent. If you are looking for a good set of bookshelf speakers, they are worth looking into. All in all, I'm very happy with my purchase and have absolutely no regrets purchasing these. Mirage M-290's. Polk Monitor 4A's. I recently purchased the M80s and they are a wonderful sound that filled the entire room. I started with just placing them on some old speaker they were replacing for stands and only running one pair of wire to each speaker and even at that I was amazed. They were replacing some KLH 15s and what a difference they were so much more accurate. I could here things in my music that I never heard before. they work great with my home theater I also purchased a mc 400 center and with adding those three speakers my movies came alive. I eventually custom built some 22" stands and filled them with lead shot at the same time I biwired them and again I was blowen away I did not think it was going to make as big of a difference as it did I would suggest this to anyone looking to optimize there sound. My overall review of these speakers is an unmatchable sound at an affordable price. 5 stars in my book. I just purchased these in Mahogany which, as others have said,look great. I previously owned a pair of Klipsch Forte's which had a 12" woofer and 12" rear firing passive radiator. Also, I think the sensitivity was like 100db at one watt. Those speakers had the best low end I've ever heard. At low volumes it would quietly fill the room with clear, detailed bass. At high volume you could feel it in your chest. They were great speakers but I found that there just wasn't enough dispersion for listening environment I had them in and they are a bit large. So, I went looking for a bookshelf fullrange speaker. I looked at PSB, Paradigm, Klipsch, Mission, JBL. The best of that bunch was Mission. Pretty good sond not much bass. Then I listened the M80's. Beautiful sound. Mids and highs are fantastic. Voices on these speakers are very clear and real sounding. A few of the reviews here have complained about the bass. When I compare these to my old Klipsch Fortes I definately lost some bass. I expected to. But, the M80's still put out a reasonable amount of bass. I mainly listen to Jazz and the bass lines I've heard don't leave me wanting for more. I suppose if your into Rap/HipHop and your looking for thundering bass then these speakers might not do it for you. It would also depend on the size of your listening room. Overall I love these speakers and don't regret selling the Klipsch at all.